The highlands in the centre of Germany offer perfect adventure race conditions. I believe we’ve succeeded to put a race together that will meet your expectations. The start of the race will be on a location with breathtaking views of the region. 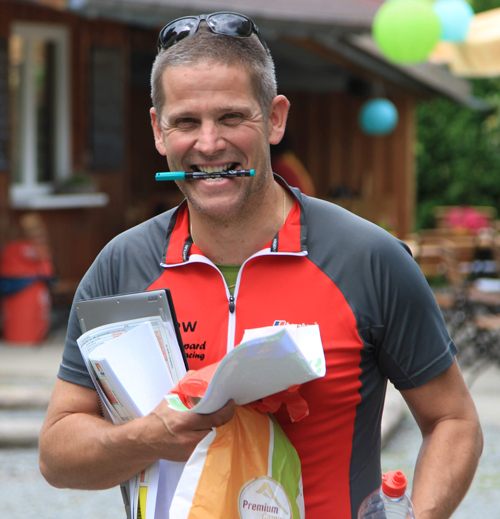 The race course will take you in several stages to steep hills on foot, quick descends by bike, plenty of water to paddle substantially, some special tasks and finally back to the finish line at Campingplatz Auenland. Each stage will have a different difficulty in terrain and/or navigation. So in some stages it might be difficult to find your way and therefore hard to move forward, others will be designed to maintain maximum speed. Like every year we have integrated all the ways to navigate we could think of, but made one exception… We’ve listened to your feedback on our survey and left out the strip-routes! Special this year is that we are proud to host the Dutch National Championship Adventure Racing for the second time! A great honor and an extra motivation to offer an exciting edition to you! See you all in Auenland! Please note that this timetable is still work in progress. This will give you an idea of the time schedule in order to plan your trip to Auenland. The final version will be communicated via this site later. Official race bib 1x per competitor Provided by organization. Personal ID- and insurance card 1x per competitor In case of emergency, can be a copy. Whistle 1x per competitor Each competitor must carry at all times a whistle that is pea-less and functional in wet conditions. It must be easily accessible at all times to sound an alert if required. Water bottle or bladder 1x per competitor Must contain at least 1 litre. Mountain bike 1x per competitor Mountain Bike appropriate for adventure racing and with properly working brakes. This will be checked up front. No road or cyclocross bikes and no race or triathlon handlebars. Helmet 1x per competitor Cycle helmet with an approved safety standard certification. (e.g. CE, UIAA or country equivalent). Front light *) **) 1x per competitor Front facing white light. May be head or handlebar mounted. Rear light *) **) 1x per competitor Rear facing red light. Must be mounted on the bicycle. Recommended spare rear light is carried amongst team. MTB repair set 1x per team Basic repair items: 2 spare tubes, patch kit, tyre levers, pump. Can stay on the MTB. Bicycle bell 1x per competitor For your own safety when on the public road. Shell layer top (jacket) 1x per competitor The shell/ outer layer jacket must be waterproof, windproof, breathable as specified by the manufacturer. Jacket must have a hood, seams tape sealed and suitable for potentially extreme conditions in an adventure race. Headlamp **) 1x per competitor Light source (such as headlamp), waterproof with the required batteries for the section of the race. Different light sources may be used in different disciplines e.g. headlamp, cycle lights. Magnetic compass 1x per team Quality compasses for accurate navigation. Compass must have a needle balanced to the magnetic zone of the race. Watch compasses do not meet these requirements. Cell phone 1x per team Cell phone with fully charged battery, turned off and in a waterproof bag/container for emergency use only. First aid kit 1x per team See details about the content below. *) Not needed for teams competing in the Middle race. **) Not needed for teams competing in the Short race. First aid kit is based on the guidelines setup by the DARS. First aid bag 1x per team First aid contents specified below and further to your own opinion. Must be contained in a waterproof bag. Emergency blanket 1x per competitor Sheet or bag of material coated in a metallic reflective agent. Used in emergencies to reflect heat. Can be used to counter hypothermia, but also provide shade or aid in visibility. (Note bags can deteriorate over time). Pressure bandage (elastic/ crepe) 1x per team 2m long x 7,5cm wide. Total length of bandage is minimum of 2 metres and minimum width is 7.5cm un-stretched. Multiple bandages are permitted. Used to create localised pressure to site of injury or wound. Band-aid 4x per team Used to cover minor abrasions and cuts. Strapping tape (sport tape / adhesive / surgical tape) 1x per team One roll of strapping tape. Minimum of 1 meter. Can be used to secure bandages or dressings and in improvised splints. Wound dressing (sterile) 2x per team Dressing minimum dimensions 7.5cm x 7.5cm each. Applied to wound to prevent further harm and promote healing. Self adhesive or used in conjunction with a bandage. Gauze dressing with nonstick film recommended. ORS sachets 2x per team Prevent dehydration. Both participants need to be able to show all mandatory items throughout the entire race. The team will get a reduction in race points if one of the items is not present unless items have been used in the race and this can be proved.